The indoor skydiving industry has exploded over the past 5 years. Improvements in technology have created comfortable, safe, efficient wind tunnels enjoyed by millions annually. The big draw is how safe and accessible the activity is. People of almost all ages (often as young as 3 years old) may enjoy freefall without the risks associated with skydiving. Over a similar time period, improvements in virtual reality have created immersive experiences. With nothing more than a smartphone and a piece of cardboard, you can step into an exotic jungle, deserted island, or beautiful mountain sunset and have a look around. Innovation around VR has increasingly been used in combination with external senses like touch, motion and even smell to create more immersive experiences. Enter a new company founded by Cody Russell and Tristan Hampson. The two have worked to combine VR with indoor skydiving to create Tunnel Vision. The new company which is part of the tech incubator EvoNexus, uses a custom virtual reality helmet and goggle setup to feed live skydiving video to the wearer. This provides a visual and experiential feedback to create as near to the real experience of freefall as you'll get without making a jump yourself. 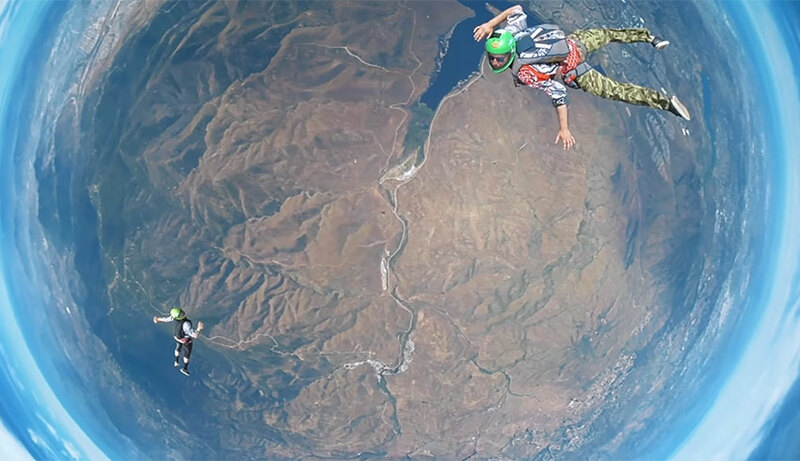 Tunnel Vision™ recreates the skydiving environment of jumping out of an airplane with breathtaking views while in the safety of a wind tunnel by using virtual reality. Virtual reality allows people of all ages and risk adversities the chance to experience what it is like to jump out of an airplane while under a coach's’ supervision in a wind tunnel, making it a safe environment that can be enjoyed year round. When a customer goes to a local wind tunnel they will now have the option to upgrade to the Tunnel Vision™ experience. 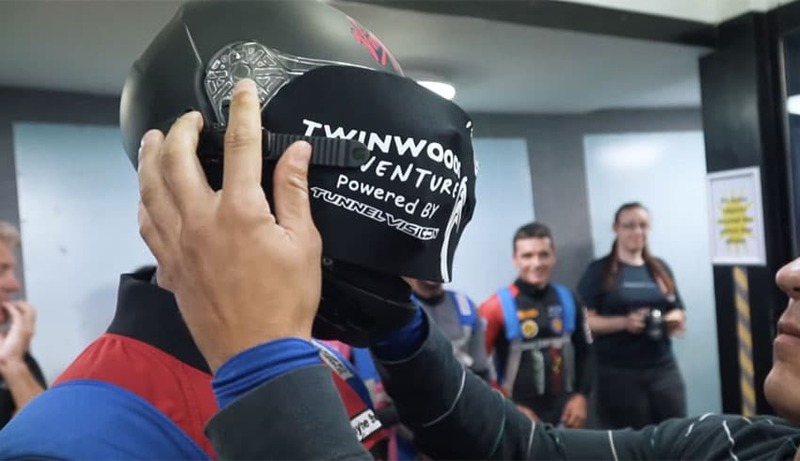 The customer will then wear a specially designed full-faced helmet with an integrated virtual reality headset and can chose to virtually skydive anywhere in the world! At first glance, the idea seems fairly straightforward. Slap on some VR goggles and hop in the tunnel. When you take a look at all the moving parts, it's not so easy. The 100mph+ windspeeds that vertical tunnels provide is enough to pull anything loose up and away. To combat this issue, Tunnel Vision created a patent pending VR helmet system which provides a comfortable and secure wearable package. A ratchet system is used to secure the goggles to a custom built helmet. Once the helmet is on, you'll need some exciting content to match the physical sensations of the wind tunnel. The company is also providing ultra high definition 4K, 360 degree video. You'll be able to look in all directions and watch the amazing experience unfold around you. Plans are in the works for future video developments. Want to fly through the grand canyon like superman? Great! Soon you'll be able to pick your experience from a growing library. A busy tunnel needs easy and seamless operation to stay on time. By offering a custom app for video delivery with an online portal, Tunnel Vision handles content delivery and software updates remotely. This keeps the process hands-off for the tunnels and allows them to focus on flying. "The video starts as soon as the flyer is in the door of the wind tunnel. The flyer is able to wear our VR helmet and see where they are going, then as soon as they are in the door the software triggers the experience to start. Once the flyer is done with their flight the software stops the video and the flyer is able to see the external environment as they exit the tunnel. " "Each flight is timed precisely to match the flight time from start to exit." To keep things safe in the tunnel, flyers are held by an instructor during their flight. The lack of spatial awareness could create dangerous situations without a helping hand for even experienced flyers. An instructor keeps the flyer in the center of the tunnel and helps 'blind' entrances and exits. Currently you'll find Tunnel Vision at two locations on either side of the world. The first at Twinwoods Adventure in the UK, and second at Airborne San Diego in California. Cody Russell says: "We are targeting the European market first, with plans to expand into 8 tunnels within the Next 6-12 months." You may contact the team for more information on bringing this experience to your local tunnel. I had the same idea some times ago, but then discarded it since I found it too dangerous. I agree that wind tunnel flying is hard. However, when we bring people into the wind tunnel using our VR technology the customer is under the instructor's supervision the entire time. We have brought hundreds of people into the wind tunnel using Tunnel Vision™ with zero issues. It is simply an amazing experience! Please feel free to reach out to our team if you are interested in becoming a partnering wind tunnel. How we can offer it to Iranian customers? Soheil, get in touch with the Tunnel Vision guys, their information is in the article!